Thoroughbred Placement Resources, Inc. improves the lives of Thoroughbred racehorses, both active and retired by providing training and rehabilitation while educating the public through the development of Breed Ambassadors. 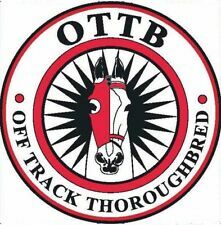 eBay Sales for Charity: Thoroughbred Placement Resources, Inc.
Get This Unique OTTB Sticker! 5"